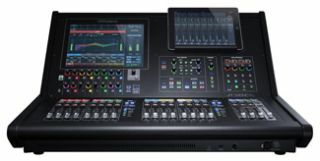 Roland’s Professional A/V division has added the new M-5000C live mixing console to its line of O.H.R.C.A.-based consoles that are designed to provide powerful features at an affordable price point. Measuring under 30 inches (74 cm) in width and weighing just 70 lbs. (32 kg), the compact M-5000C carries the features of the flagship M-5000, making it ideal for theaters, portable churches, OB trucks/vans, touring, or any application demanding power and flexibility in a small footprint. Along with a 96 kHz sampling rate for superb sound quality, M-5000C has a 72-bit summing bus, newly designed, discrete analog circuitry, and a redundant power supply. In addition to 16 inputs and eight outputs on the console, the M-5000C also features two expansion interface slots that can accommodate REAC, Dante, MADI, Waves SoundGrid, and other XI-Series expansion cards. The M-5000C supports the flexible workflow at the heart of Roland’s O.H.R.C.A. platform. Control includes a 12-inch color touchscreen; 20 channel faders in three groups; anchor points; DCA spills; multifunction knobs and buttons; and a user-assignable section. Remote control software (Mac/Windows) that extends the user interface beyond the built-in GUI, resulting in flexible organization of critical pages or meters on external monitors will be available soon, according to the company, while the M-5000C will be available in Q4 2015. The O.H.R.C.A. (Open High Resolution Configurable Architecture) platform provides a mix engine of 128 freely definable audio paths; open audio architecture supporting Dante, MADI, Waves SoundGrid, and REAC audio protocols; and audio delivery over video using SDI, DVI, and SFP cabling. Built-in REAC ports support seamless integration from the console for multi-track recording/playback, Roland M-48 personal mixers, and several I/O box choices, all at high-resolution 24-bit 96kHz.